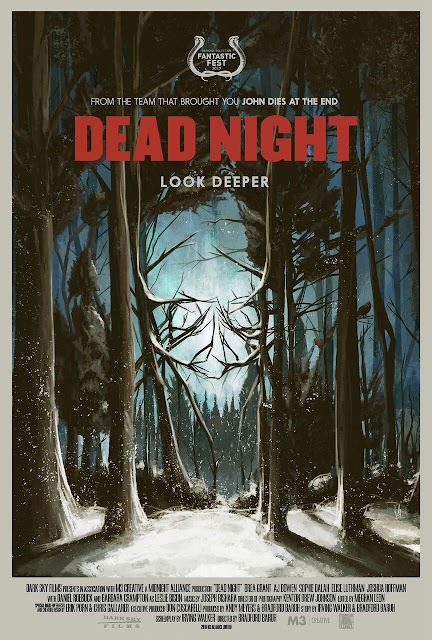 From the producers of JOHN DIES AT THE END and with genre icon Barbara Crampton (RE-ANIMATOR) as lead actress, Dark Sky Films is proud to announce the theatrical and VOD release of Bradford Baruh's directorial debut, DEAD NIGHT. DEAD NIGHT also stars Brea Grant, AJ Bowen, Sophie Dalah, Elise Luthman, Joshua Hoffman and Daniel Roebuck. Mixing original storytelling with timeless supernatural elements, Bradford Baruh's directorial debut features a stellar cast of genre favorites including AJ Bowen and Barbara Crampton and delivers a wild and blood-soaked weekend away. James and his wife Casey load up their two teenage kids and head out to a remote cabin in Oregon for a weekend trip. When James heads into the snowy forest in search of firewood, he encounters an enigmatic woman passed out in the snow. Bringing her back to the cabin for help, the family has no way of knowing that the woman's presence is the catalyst for a series of events that will change their lives forever. quirky, barely-contained evil is a delight." DEAD NIGHT hits theaters (see below) and digital/VOD on 27th July 2018.